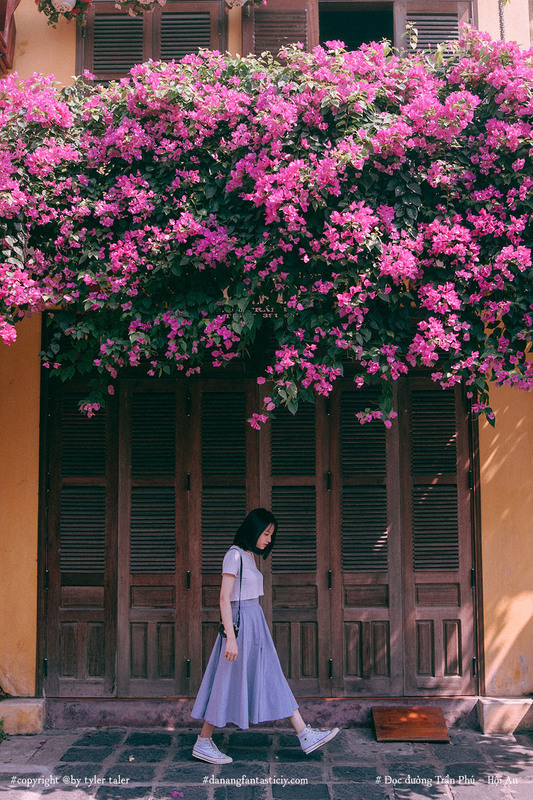 A visit to Danang and Hoian ancient town can never be complete without a capturing moment with the Bougainvillea vines. 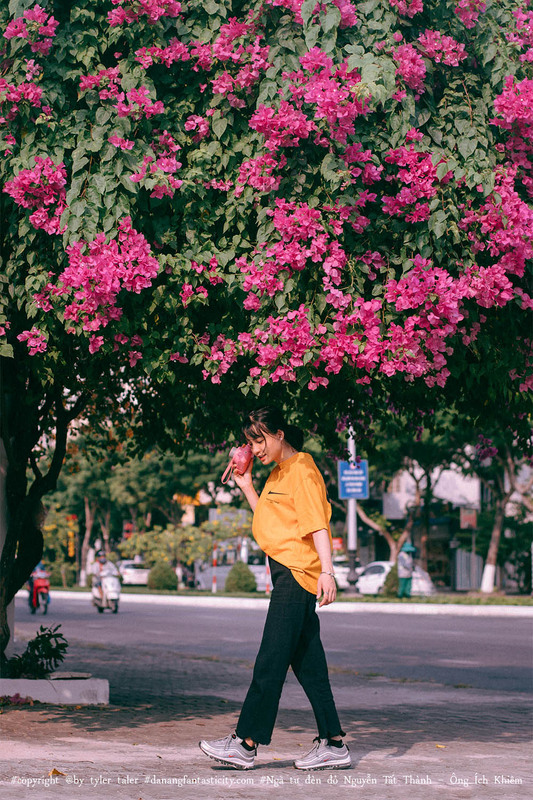 Bougainvillea flowers are seen as the local ‘specialty’ in Danang and Hoian, adorning most streets, alleys and corners. Their charming hues varying from violet, hot pink to pristine white are irresistible to anyone who happens to catch a glance. 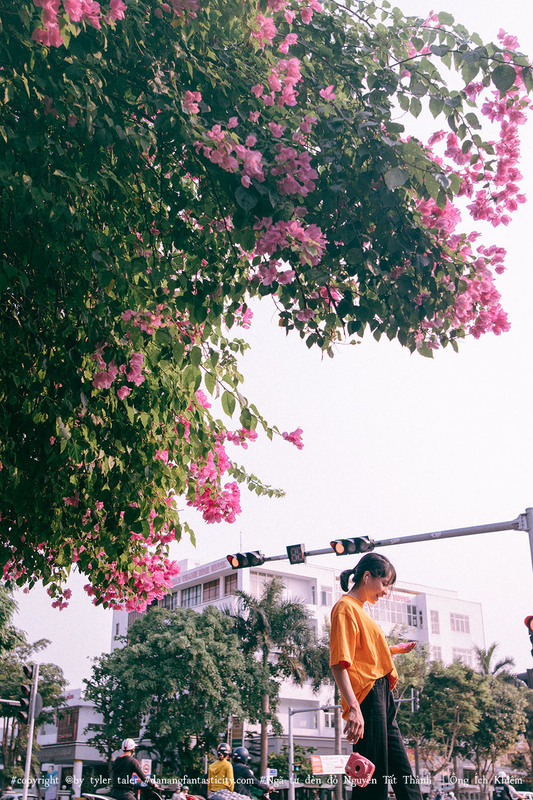 Under the warm summer beams, a Bougainvillea-covered street corner appears alive and outstandingly picturesque. 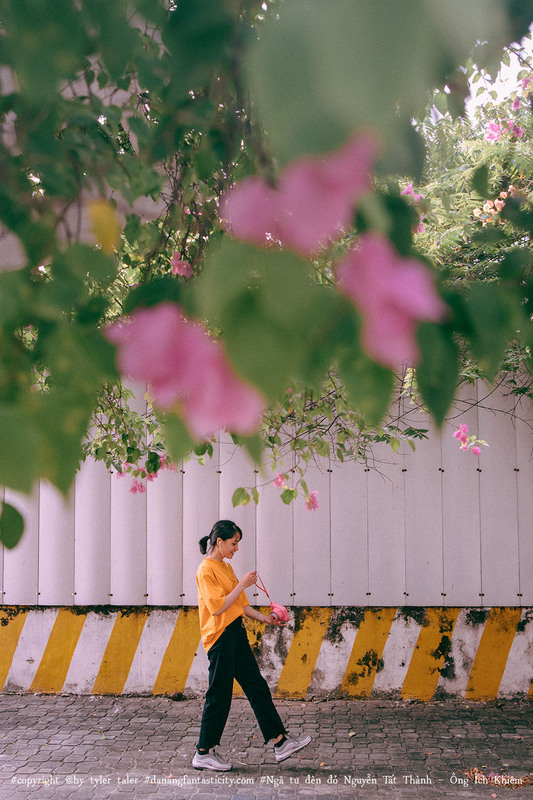 Coming to Danang this time of the year, besides the beautiful sunshine and azure sea, you’re bound to be captivated by countless vibrant-hued Bougainvillea bushes along city streets. 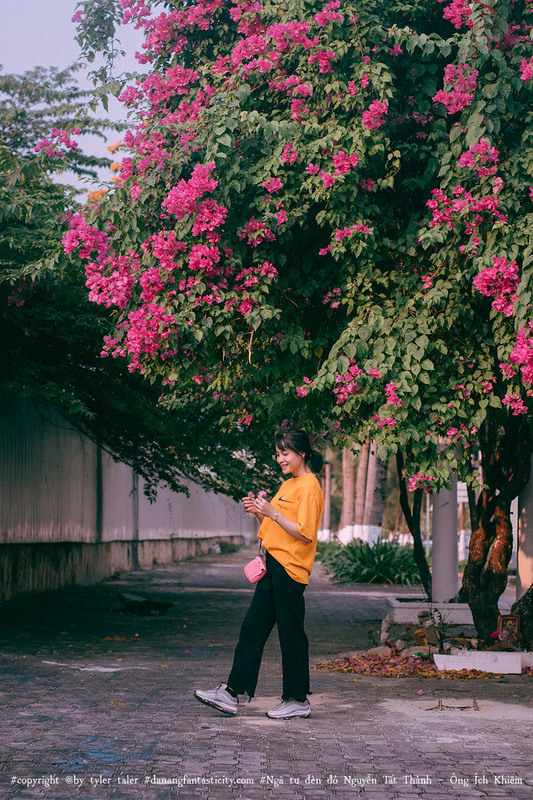 One of the most stunning sight to admire Bougainvillea flowers is the junction at Nguyen Tat Thanh – Ong Ich Khiem St.
Strolling along this road, you’ll stumble upon a corner where the Bougainvillea booms in vivid pink, pure white or eternal yellow. Such spectacle might already be grasped from a distant view. 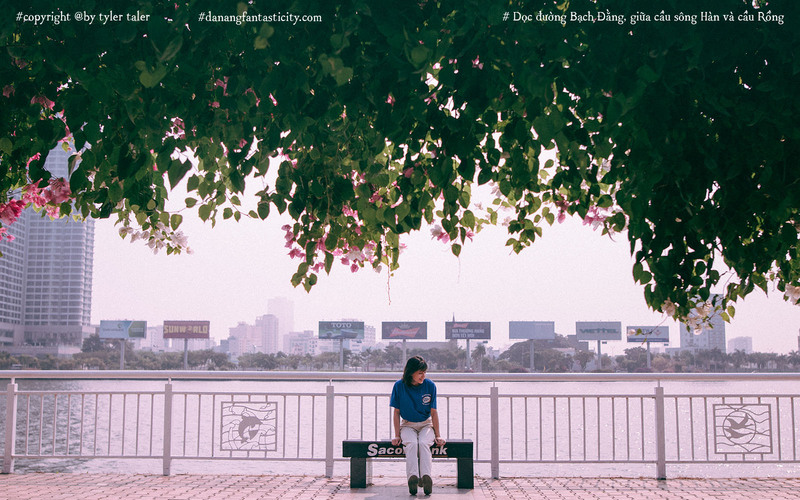 The path along Bach Dang St. is also another sight where the Bougainvillea flourish. 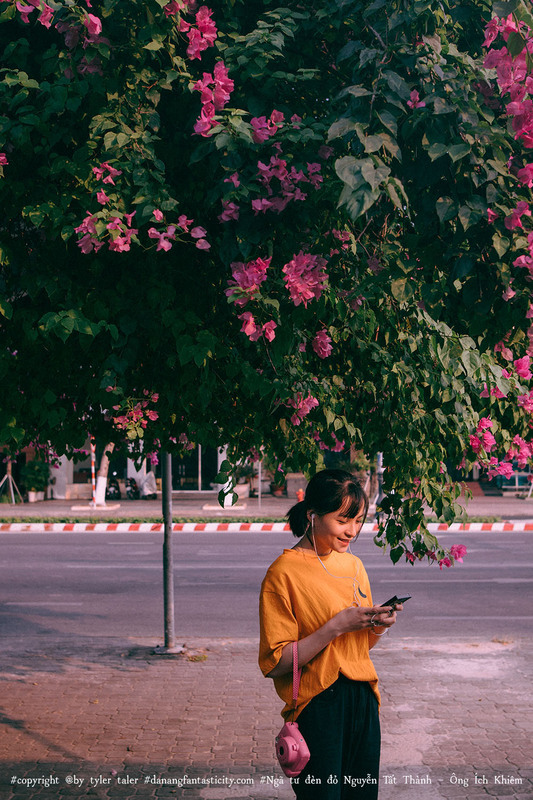 When dusk is setting and the eastern sunlight has lost its intensity, it could not be more relaxing to walk a bike or take a stroll on the pavement, or rest under the Bougainvillea shades and find yourselves audience of some chess game which usually takes place between old venerable grandpas. 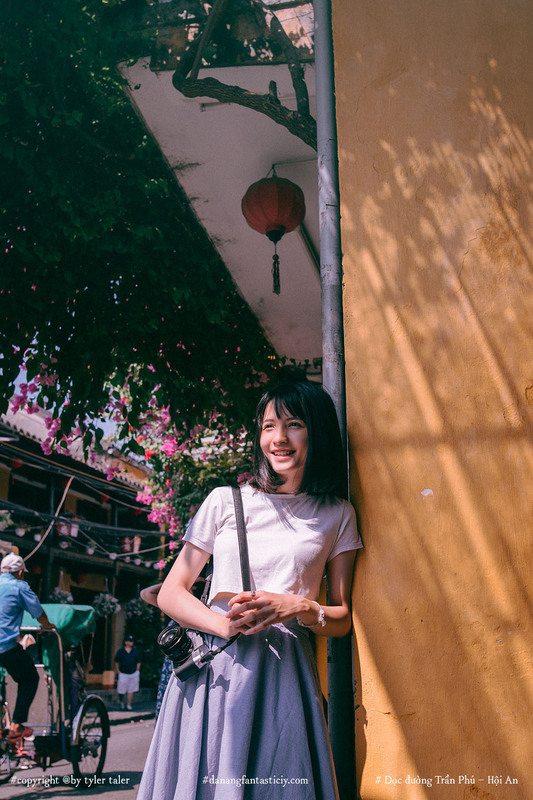 Coming to Hoian Ancient Town this season you’ll get to admire the bright colorful mosaic of houses flecked with Bougainvillea. The beautiful vines not only enchant the individual residence but also give the neighborhood a light-hearted and charming ambiance. 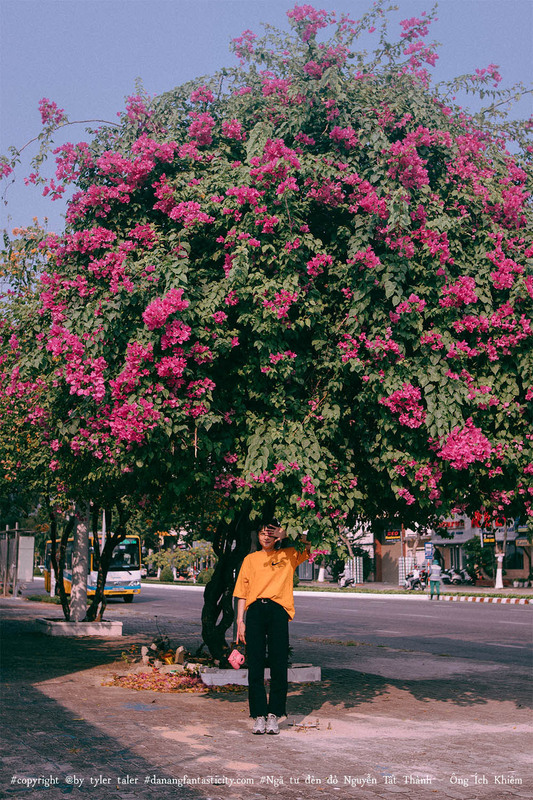 Hardly any visitor can bear to leave Hoian without taking a photo with the beautiful Bougainvillea. 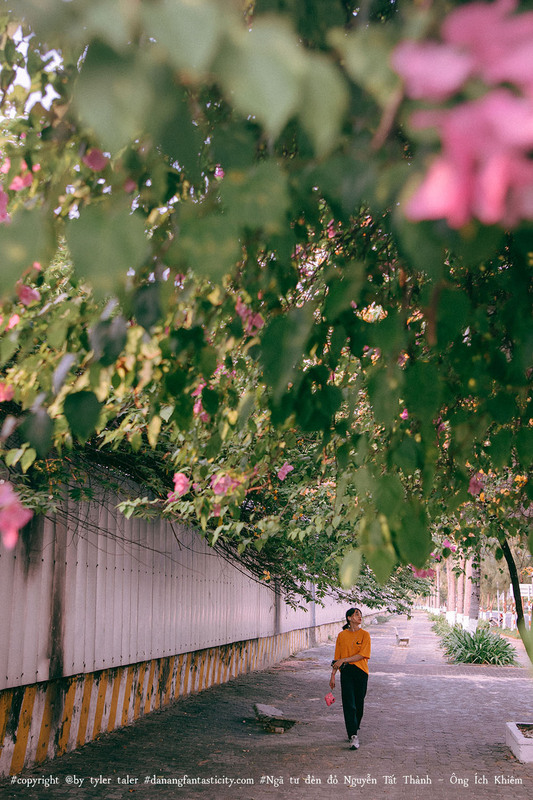 Here the Bougainvillea is easily spotted in front of almost every house, along the old streets and on Tran Phu – Hoi An route, casting a unique hue over the revered town. 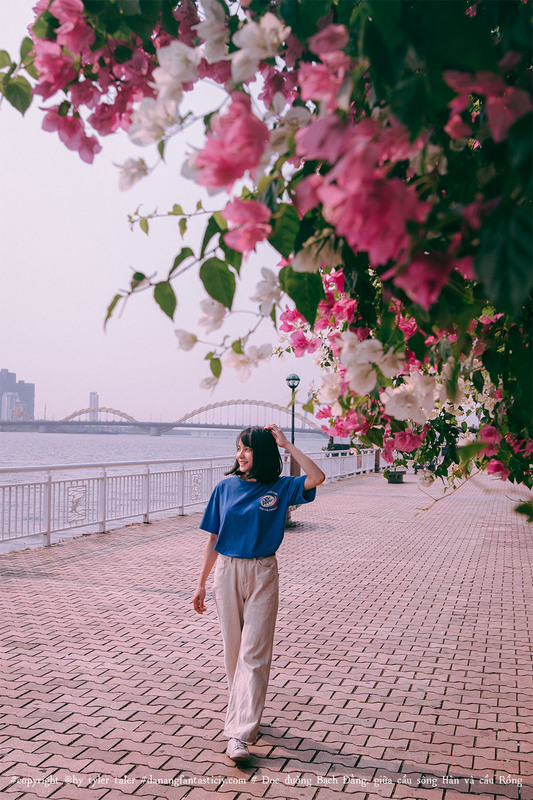 The Ancient Town, known for its mystique and rusty look, is now coming out in vibrant liveliness with the Bougainvillea. Fragile yet entrancing, these frail little vines are a delightful scene to those lucky enough to pass by. 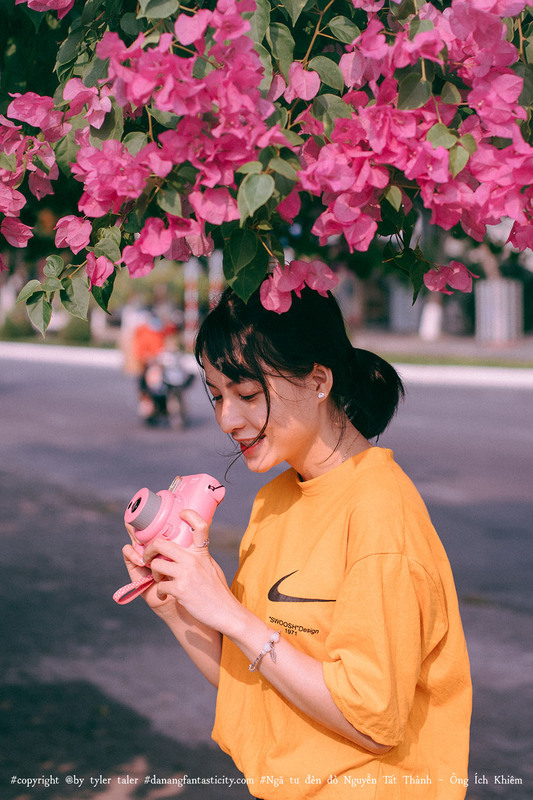 The Bougainvillea is a typical vine, easy to plant and does not require much care. It can flourish extremely well in the middle coastal climate which is characterized with high temperature and humidity. 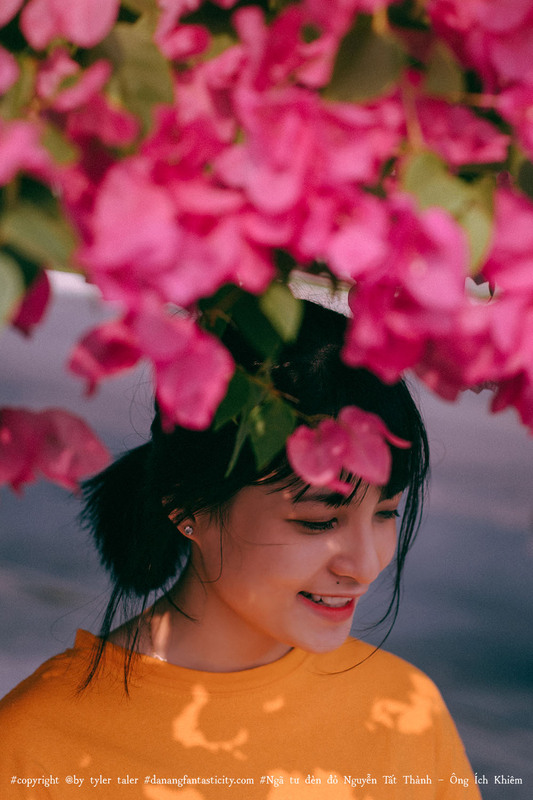 Summer is the best season to see the Bougainvillea bloom at its greatest vigor. 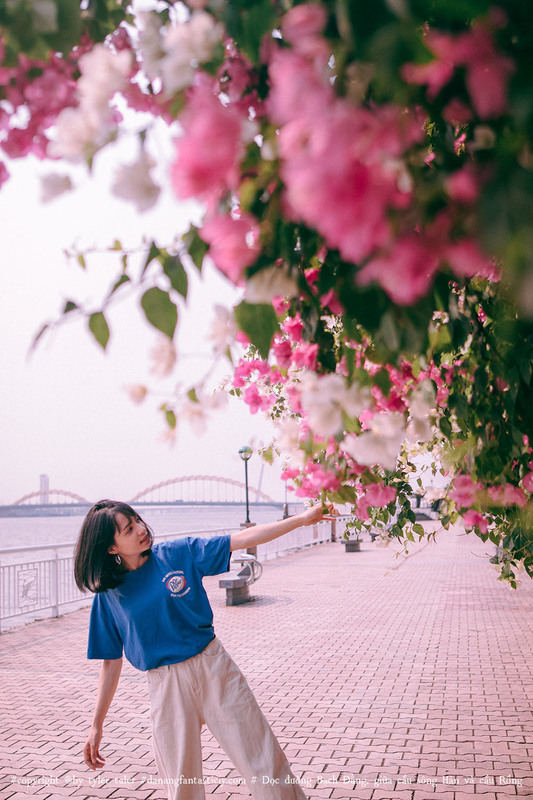 The blooming Bougainvillea has been the singular ‘seasonality’ of Danang – Hoian, which is bound inspire visitors with awe this summer.